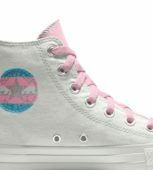 February 4, 2017 at 9:28 am EDT | by Lou Chibbaro Jr.
With music blaring from two large speakers perched in the back of a pickup truck, several hundred people gathered on the sidewalk in front of the Trump International Hotel in downtown Washington Friday night as part of an LGBT “dance protest” against policies of President Donald Trump. After dancing and listening to speakers at the site of the hotel, participants followed members of the D.C. LGBT group WERK for Peace, which organized the event, in a procession along Pennsylvania Avenue, N.W., to the White House. Leading the procession was the pickup truck as it continued to play dance music. 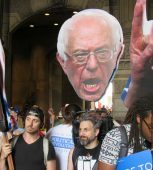 D.C. police quickly closed surrounding streets long enough to make way for the colorful procession, which included some wearing T-shirts and leotards despite temperatures hovering in the low 30s. Organizers said they didn’t apply for a permit to secure street closings in advance of the protest. “We are here today to celebrate in solidarity our intersectionality and our resistance,” said lead organizer Firas Nasr in opening remarks as the crowd assembled outside the Trump Hotel. Nasr, who is one of the founders of WERK for Peace, told the gathering at the hotel that organizers selected dance music from all seven Middle Eastern countries that the president included in his controversial executive order that temporarily bans people from those countries from entering the U.S. When the procession reached the corner of 15th Street, N.W. and the section of Pennsylvania Avenue where the White House is located, and beyond which private vehicular traffic has been banned since the 2001 terrorist attacks, the pickup truck stopped. Participants in the protest then carried the speakers further along Pennsylvania Avenue toward the White House as music continued to play. The procession came to an end a short distance from the White House where a 10-foot high chain link fence blocked further access to the White House. Signs attached to the fence said it was put in place to temporarily close that section of Pennsylvania Avenue to pedestrians to enable construction workers to disassemble the large reviewing stand where the president and his family watched the inaugural parade on Jan. 20. Dimitry Meister, one of the WERK for Peace members who helped organize the protest, said he viewed the dance protest as “more of a celebration toward intersectionality and acceptance of everybody” than a protest specifically against Trump. 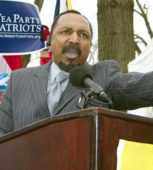 He noted that many straight people who are supporters of the LGBT community participated in the event. One of them, D.C. resident Chris Martin, propelled himself along the entire distance from the Trump Hotel to the White House in a wheel chair. Karen Serio and her partner Ann West, who are suburban Maryland residents and members of the LGBT supportive Metropolitan Community Church of Washington, said they wanted to join the protest, among other things, to show that people of faith are opposed to many of the Trump administration’s actions taken during the first two weeks Trump has been in office. 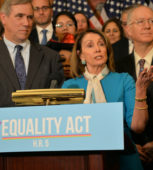 The White House released statements over the past week saying the president would not rescind an executive order issued by President Barack Obama in 2014 banning LGBT employment discrimination by federal contractors. Earlier this week, White House press secretary Sean Spicer said Trump had no immediate plans to sign and issue a draft “religious freedom” executive order that advocates say would curtail LGBT rights. 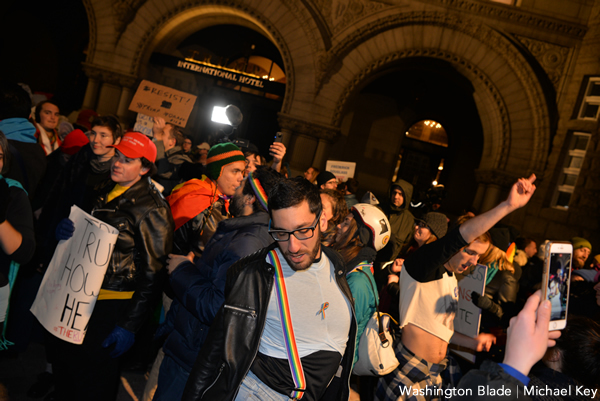 The Feb. 3 dance protest at the Trump Hotel and White House came about three weeks after WERK for Peace organized what it called a queer dance party outside the Northwest Washington home of then Vice President-elect Mike Pence. Not re tipping, but what a wonderful event! Thanks to the Blade for sharing. What a joke. Continued mass hysteria over nothing. Were you saying as much during the march protesting abortion rights? Then you have self-loathers like Miss Milo baiting and agitating people with hate speech around college campuses to egg on social unrest. She’s really good at getting publicity for herself. Too bad they didn’t allow the protestors to meet miss Milo, they just wanted to give her a group bear hug! I read Miss Milo hates being gay and thinks you can NEVER be happy being gay. Obviously that means she’s miserable with herself and wants to make others the same. She should consider a full frontal lobotomy then. 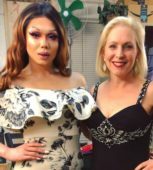 She also has said she’s want conversion therapy. Maybe we can insert a an electric cow prong up her ying yang and put the juice on high!! It will put some frizz in her hair.